Stand a chance to win a set of double tickets! 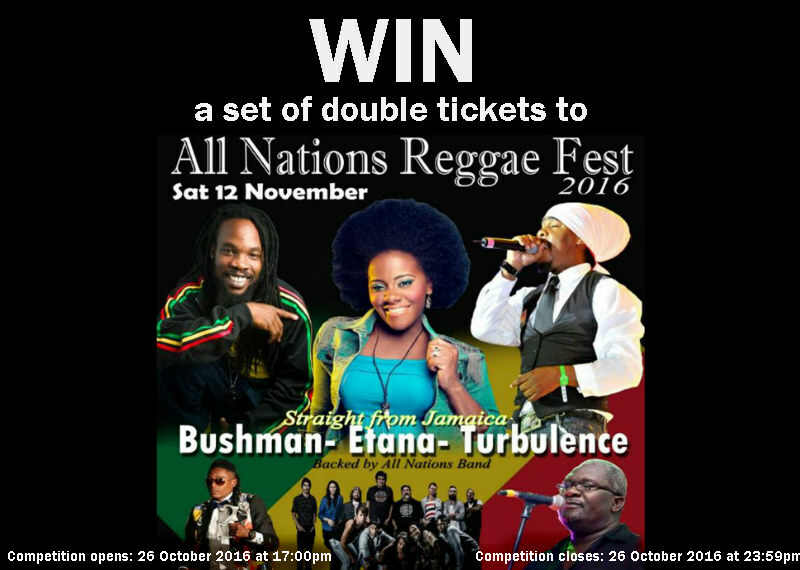 5 winners will each receive a set of double tickets to The All Nations Reggae Fest taking place on 12 November 2016. SMS the keyword "EXPRESS", followed by "CTN" (should you wish to attend the Cape Town show), or JHB (should you wish to attend the Johannesburg show), followed by your name and City (e.g. EXPRESS/JHB/NAME/CITY) to 33650 within the Competition Period. 1.1. The Afternoon Express All Nations Reggae Fest Competition (Competition) will be run by Cardova Trading (Pty) Ltd (Organisers/we/us/our). Entries for the Competition will open at 17h00 on Wednesday, 26 October 2016 and will close at 23h59 on Wednesday, 26 October 2016 (Competition Period). 4.1. Entrants must, SMS the keyword "EXPRESS", followed by "CTN" (should you wish to attend the Cape Town show), or JHB (should you wish to attend the Johannesburg show), followed by your name and City (e.g. EXPRESS/JHB/NAME/CITY) to 33650 within the Competition Period. 5.1. 10 (Ten) winners (Winner/s) (5 (five) for the Johannesburg Concert and 5 (five) for Cape Town Concert) will be selected randomly by means of an automated system from the valid entries received within the Competition Period within 48 (forty-eight) hours from the closing date of the Competition. 5.2. We will contact the Winners within 3 (three) days from the prize draw on the cell phone number from which the entries were sent. If a Winner is not contactable within 3 (three) days from the prize draw, and after we have made at least 3 (three) attempts to contact the Winner, that Winner will forfeit the prize and we shall have the right to select a different Winner on the same conditions except that we shall only be required to make 1 (one) attempt to contact each further Winner drawn. 5.3. Each Winner will be required to provide a copy of his/her Identification Document as required in terms of the Consumer Protection Act, 68 of 2008. If a Winner fails to provide a copy of his/her Identification Document within 3 (three) days from being requested to do so, that Winner will forfeit the Prize and shall have no claim against us. 5.4. The Winners may also be announced live on Afternoon Express once the Winner is confirmed. 6.1. The 10 (ten) Winners will each receive a set of 2 (two) tickets to the All Nations Reggae Fest, 5 (five) Winners will be selected for the All Nations Reggae Fest taking place at the Carfex in Johannesburg on 5 November 2016 and 5 (five) Winners will be selected for All Nations Reggae Fest taking place at the Castle of Goodhope in Cape Town on 12 November 2016. 6.2. The Prize excludes all items not mentioned in clause 6.1 and is subject to the terms and conditions of any third parties providing services or items included in the Prize. 6.3. The Prize does not include any travel costs or arrangements. The Winners are required make their own arrangements to attend the All Nations Reggae Fests in either city. 6.4. We will contact the Winner per telephone to to make arrangements for delivery or collection of the Prize. 7.2. The Winners will only be confirmed once valid copies of their identification documents are received and a validation process has taken place. 7.6. We will need to process your personal information to validate your entry and, if you are Winner, to make the Prize available to you. By entering this Competition, you specifically consent to us processing your personal information for these purposes. 7.9. If required by the Minister of Trade and Industry, the National Consumer Commission or for whatever other reason, we will have the right to modify or terminate this Competition with immediate effect and without notice of such modification or termination. In such event, all entrants hereby waive any rights, which they may have against us and hereby acknowledge that they will have no recourse or claim of any nature whatsoever against us.1.1. SMS the keyword "EXPRESS", followed by "CTN" (should you wish to attend the Cape Town show), or JHB (should you wish to attend the Johannesburg show), followed by your name and City (e.g. EXPRESS/JHB/NAME/CITY) to 33650 within the Competition Period.